You searched for clinton foundation - Truth or Fiction? Clinton Foundation Paid for Chelsea Clinton's Wedding-Unproven! Unfounded rumors are circulating that the Clinton Foundation paid for Chelsea Clinton's 2010 wedding. Clinton Foundation Cargo Ship Raided, Contraband Found-Fiction! A fake news website is behind a false report that a Clinton Foundation cargo ship was raided and illegal contraband was found. Charles Krauthammer: The Clinton Foundation is Organized Crime-Incorrect Attribution! An essay allegedly written by Charles Krauthammer that calls the Clinton Foundation "organized crime" has been making the rounds. $375,000 Deposited to Khan Law Account from Clinton Foundation-Unproven! The Clinton Foundation paid $375,000 to Khizr Khan's law firm for supporting Hillary Clinton. Jessica Leeds, a woman who accused Donald Trump of sexually assaulting her in the 1980s, does not have the same phone number as the Clinton Foundation, despite reports. Gov. 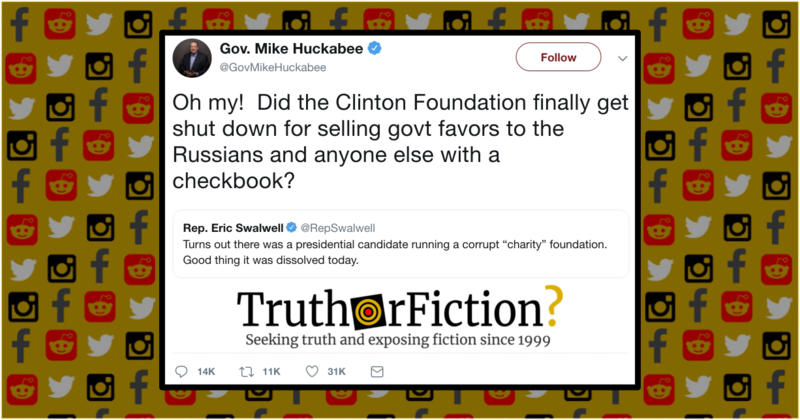 Huckabee’s December 2018 tweet on news about the closure of a presidential candidate’s foundation was mistaken for a hoax. Is a Mike Huckabee Tweet About the Clinton Foundation Real? EpiPen Maker Donated to Clinton Foundation, Hiked Prices-Truth! & Fiction! EpiPen maker Mylan partnered with the Clinton Foundation before raising the price of the life-saving devices by 400 percent, sparking speculation that the Clintons profited from or enabled the price hikes. FBI Director James Comey Received Millions from Clinton Foundation-Unproven! It's been rumored that FBI Director James Comey didn't prosecute Hillary Clintons because he received millions from the Clinton Foundation. Clinton Foundation Buys $137 Million in Illegal Arms for Post Election-Fiction! A fake news report alleges that the Clinton Foundation purchased $137 million in illegal arms that would be smuggled into the U.S. immediately after the 2016 election. FBI Arrests 22 Clinton Foundation Employees Days After Reopening Investigation-Fiction! False reports that the FBI arrested 22 Clinton Foundation employees one day after reopening an investigation are based on reports from fake news websites based in Panama.